First it was Windows 7 RTM Build 7600 and now its Office 2010 Beta , it really is one of those days when the latest builds of both Windows 7 RTM Build 7600 and Office 2010 Beta has hit all over the web! The Build number for the leaked build of Office 2010 Beta is 14.0.4302.1000 and is available in both 32 and 64 bit flavors. Even though the title bar on Word 2010 says its “Technical Preview”, but the About dialogue box clearly states it as Beta as can be seen in the screenshot above. 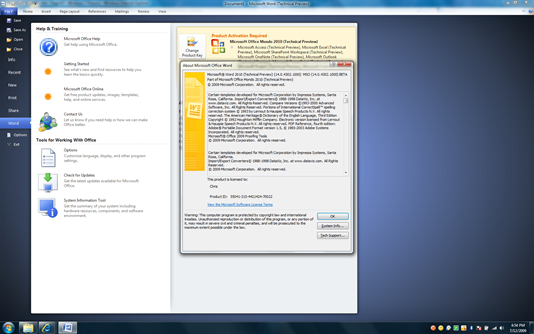 Office 2010 Technical Preview Build version 14.0.4006.1010 was leaked back in May 2009. Like Windows 7 RTM Build 7600, you can download Office 2010 Beta at a private hub near you! I will have more to share on Office 2010 Beta including screenshots soon. So stay tuned! 😆 its great, congratulation !!!!! 😆 Very interesting and informative article. I am unable to download the torrents for Office 2010 beta 1 from your website and also the Win 7 RTM x86. when i click the link it shows a screenshot that you have taken from the piratebay does that mean i need to go there to get it downloaded. wow, nice office 2010. I also want to write this on my blog. since I had to reboot my whole computer cuase my startbar and desktop wouldnt come up (explorer.exe failed or deleted) (got this pc from my aunt)(she's a teacher) anyway, how where can i download and reinstall the microsoft programs I had on my pc?? I have a disk I got with it but its designed for 95 and this pc is XP. I had: Word, Excel, PowerPoint, Schedule, and Access. before I had to do restore disk. I dont wont to pay these programs of what I already had before. can someone help me here. Some seem to have problems with the New Beta 2010. Listening to the first post, i am reluctant to even try the beta. Office 2010 is good way for user I am using its a best for me . This is music to my ears.This is really a great post! Thanks for sharing. A blog really owes its success to its loyal readers and faithful followers. when i click the link it shows a screenshot that you have taken from the piratebay does that mean i need to go there to get it downloaded.